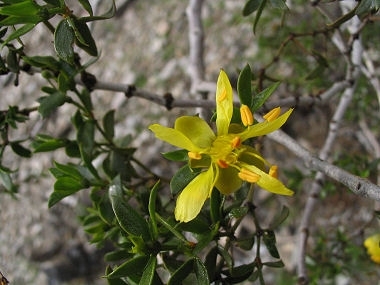 The Creosote Bush is a member of the caltrop family. It is an evergreen shrub which grows to 10 feet in height, and has many branched woody stems that grow from the ground. 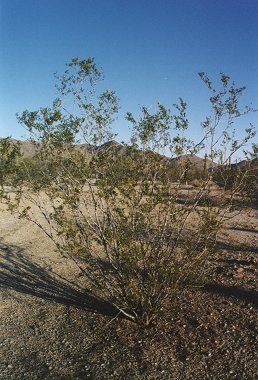 Creosote Bush typically grows below 4500 feet in elevation and prefers dry plains and mesas. The plant is a common and wide spread shrub in three of the four North American deserts (the Mohave, Sonoran and Chihuahuan Deserts, it is too cold for the plant to grow in the Great Basin Desert). Leaves are small, dark green and oblong to 3/8 inches long, with two leaflets joined at the base. The plant can bloom at several times during the year, but flowers are most common between March - April and November - December. Flowers are yellow with 5 petals to 1 inch in diameter and are followed by a small, round, fuzzy, white fruit about 1/4 inch in diameter. Creosote Bush gets its name from the odor the leaves emit after a rain (or when crushed), though creosote is a petroleum product and unrelated to the bush. The Creosote Bush is the most drought tolerant plant in North America. It can live for at least 2 years without any rain whatsoever, and will lose its leaves and even shed branches to reserve the last water and nutrients for the crown. The roots of the creosote bush have been shown to inhibit the growth of bursage roots and the roots of other creosote bushes (which is why the plants often grow at evenly spaced intervals in the desert). The plant does not inhibit the growth of other species though, and often acts as a nurse plant for other plants and cacti which are able to survive in the little shade the bush provides. The only mammal that eats creosote bush leaves is the jackrabbit, which turns to them as a last resort when nothing else is available. Other animals, such as rodents and reptiles will dig their burrows in the soil beneath the shrubs. Creosote Bushes live a very long time. Though each stem of the plant may live to be several centuries old, new ones are continually produced from the outer edge of the root crown, eventually forming a ring. There is a creosote bush ring in the Mohave Desert in California that is several thousand years old. Native Americans brew a medicinal tea from the plant.